A lonely bus stop, a trumpet-playing scout and a woman who refuses to pay him anything for his off-tune performance. This dryly humorous opening sets the tone for rest of the film which tells the story of Vic, a woman who has just been released from prison and who is on the hunt for some peace and quiet. 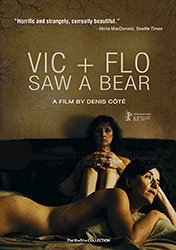 She moves into a relative's house in the Canadian forest and receives a visit from her lover, Flo. The two of them take each day as it comes, exploring the countryside in a golf cart and enjoying the scenery. Life could be so wonderful-if only Vic's rather unconventional probation officer wouldn't keep turning up. Vic also finds her girlfriend's sorties to local bars unsettling. A friendly woman in the neighbourhood, a gardener, soon turns out to be a shadow from the past; signs of impending threat begin to multiply and even the forest seems to have treacherous traps in store. With his film's collection of eccentric characters, his bizarre directing ideas and the work's mysterious atmosphere, film critic and documentary/drama director Denis Cote creates an artificial world with its own completely unpredictable reality. Fascinating and beguiling, Denis Cote's mesmerizing meditation on the relationship between man and beast.